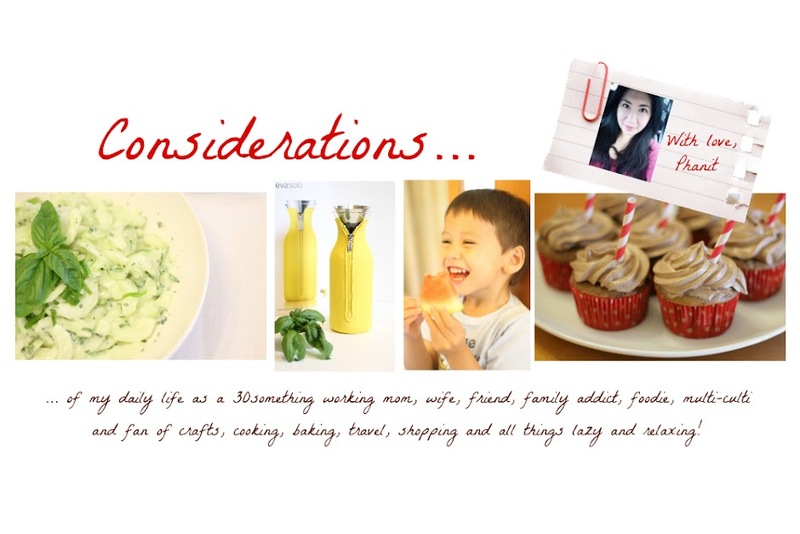 So finally I am finding some time to edit this post and luckily Blogger isn't giving me any problems! I was browsing Pinterest and pinning like crazy on my boards... mostly the food and dessert boards... and came across a bunch of yummy sounding Nutella Cupcakes. They have been on my mind ever since. Last Friday was the perfect occasion, my friend had a "31" purse party at her place, so I thought I'd bring some Nutella cupcakes. I knew I had to make them Thursday night, and after a busy evening of running late from work, getting Julian to bed late and having a bunch of things to clean up and prep for the next time, I was exhausted and running out of time. Whew... but stubborn me, once I have made up my mind about something - I want it! :) Instead of assembling all my ingredients, measuring everything and leaving a mess to be cleaned up I searched my pantry and found a boxed yellow cake mix. Oh you know you have used those before as well :) I just Nutellarized mine. I picked up Julian early on Friday so that I would have time to at least whip up fresh Nutella frosting since I hate the storebought buttercream or creamcheese frostings. And they turned out delicious!! They were definitely a hit at the party :) And so easy to make!! Endlich hatte ich mal Zeit mich diesem Post zu widmen. Zum Glueck gab's keine Probleme mehr mit Blogger! Hach ich liebe Pinterest! 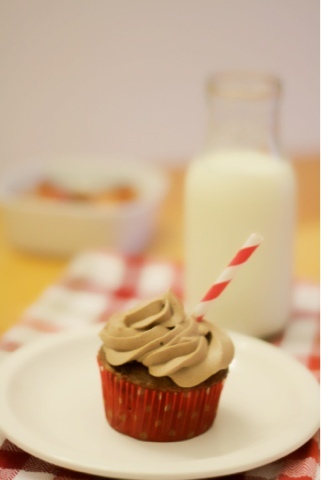 Ich kann mit dem pinnen einfach nicht aufhoeren, es gibt so tolle Ideen und Fotos, vor allem von Essen und Nachtisch :) Letztens habe ich so viele schoene Nutella Cupcake Rezepte gesehen, die gingen mir seitdem nicht mehr aus dem Kopf. Letzten Freitag hatte ich dann die passende Gelegenheit mal welche auszuprobieren. 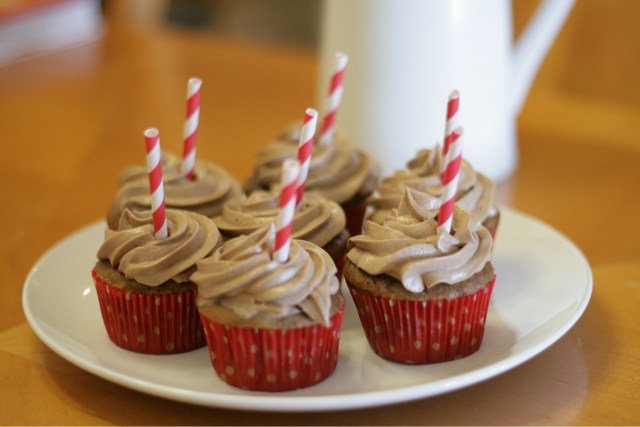 Eine Freundin hatte eine "31 Purse" Party also habe ich mir gedacht, ich bringe Nutella Cupcakes! Leider musste ich sie schon Donnerstag abend machen. Doch nach einem langen Arbeitstag und Hubby noch auf Geschaeftsreise, kam der kleine Mann erstmal etwas zu spaet ins Bett. Dann musste noch einiges aufgeraeumt werden und fuer den naechsten Tag vorbereitet werden, ploetzlich hatte ich kaum noch Zeit! Puuuh, aber da kann ich ganz schoen stur hartnaeckig sein. Anstatt nun alle Zutaten zusammenzusuchen, messen und wiegen und wieder aufraeumen habe ich meine Kueche durchforstet und bin fuendig geworden - ich hatte noch eine Backmischung fuer ganz normalen Butterkuchen! Ach ich weiss, ihr habt auch schon mal zu solchen Methoden gegriffen :) Ich habe meine Bachmischung nur mit Nutella aufgepeppt. Freitag nachmittag habe ich Julian dann frueher von der Tagesmutter abgeholt, damit ich wenigstens Zeit fuer ein selbstgemachtes Frosting hatte, denn ich hasse die Buttercream oder Creamcheese Frostings, die es schon fertig in der Tube gibt. Und die cupcakes waren sooo lecker! Die kamen auf jeden Fall super auf der Party an, und sind sooo einfach zu machen! Follow directions on box to make yellow cake batter. Add Nutella and slightly stir to make swirls, don't incorporate completely unless you prefer. Bake according to directions on box or until toothpick inserted comes out clean. Whip butter and confectioner's sugar in a large bowl until fluffy. Add Nutella until well incorporated. Slowly add cream (I think I needed about 1 - 1.5 cups) with blender on low, then turn to high until well blended and fluffy. Frost cooled cupcakes. Kuchenteig je nach Anleitung anruehren. In 24 Cupcakefoermchen fuellen und nach Anleitung backen, bis ein Zahnstocher in der Mitte gepiekst sauber wieder rauskommt. Fuer das Frosting die Butter in einer grossen Schuessel mit dem Puderzucker mischen und mit Mixer schoen schaumig aufschlagen. Nutella mit reingeben und gut vermischen. Nun unter langsamen Ruehren die Sahne reingeben, dann den Mixer hochstellen und alles so lange gut mixen bis das Frosting schoen fluffig ist.